Samsung Galaxy S IV Is The Answer to the iPhone 5: One Week of Battery Life! Bob Freking just sent us one of his famous concepts that he puts so much work into. 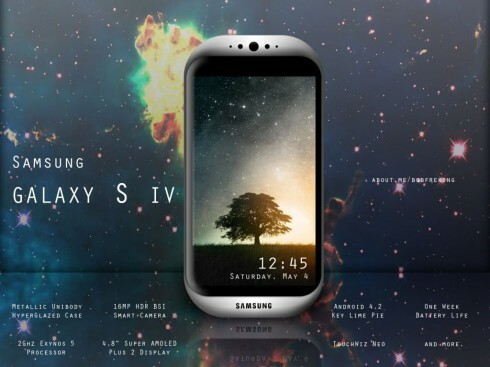 This time it’s the Samsung Galaxy S IV that he created and rendered, as shown below. You probably know that Apple beat Samsung in court just days ago, so Samsung must retaliate in the future, maybe with a device like this one, that gives up plastic and TouchWiz and provides one week of battery life. There’s also a 16 megapixel camera on board, a true Pureview competitor as far as camera tech goes. Galaxy S IV uses a RGB 1080p SAMOLED display at 4.8 inch, but with on screen buttons this time. This is a phone for 2013, that uses an incorporated and non removable battery, that provides a whole week of functioning without charging. Other specs include 32GB of storage, a cleaner TouchWiz without silly gimmicks and a 2 megapixel smart camera at the front. Add to that hyperglaze 2 protection for the case and we’re done. Bob also imagines that this new Galaxy S model for 2013 will have a metallic unibody case, a 2 GHz Exynos 5 processor and a Super AMOLED Plus 2 display. The OS here is Android 4.2 Key Lime Pie, with TouchWiz Neo on top. The design is very alien-like and actually reminds me of an older Nokia mockup. Do you like this new direction imagined for Samsung?